This egg experiment is a new take on an old favourite. We have made bouncy eggs before, we even made them fluorescent! This year we decided to add more colour. This is a really simple experiment, you probably have everything you need already in your kitchen and it is guaranteed to entertain both the young and the young at heart! 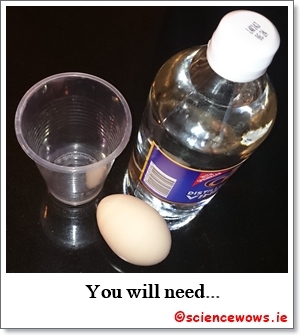 Place the raw egg in the glass and cover with vinegar, making sure the egg is completely covered. Leave overnight or up to 48 hours if necessary. After this time, remove the egg carefully and rinse it in a bowl of water. The vinegar will have dissolved all the shell of the egg, leaving just the egg membrane keeping the structure together. The “naked” egg will be soft and bouncy and a little delicate so do be carefully when washing any remaining shell off. Next place the egg into an empty glass and cover with water, add at least two teaspoons of your chosen food colouring (we used red here) and leave overnight again. 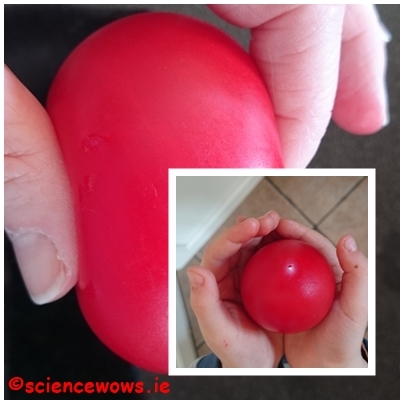 The next day carefully remove the egg from the coloured water, rinse and pat dry (you may find your fingers will get a little stained from the food colouring but it will wash off). When the egg is in the vinegar you will notice some bubbles forming and eventually a foam will appear at the surface of the vinegar. The eggshell is made up of calcium carbonate. The vinegar (an acid) reacts with the calcium carbonate (a base) producing a salt and a gas called carbon dioxide (these are the bubbles you see). The vinegar will keep reacting with the calcium carbonate until it is all gone, leaving the egg contained in just the cell membrane. A delicate, but bouncy egg. 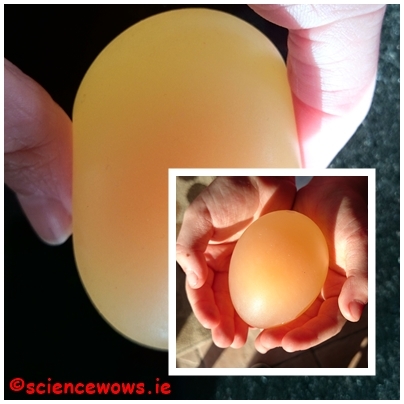 When the egg is then placed in coloured water the water will travel into the egg by a process called osmosis. The egg will swell a little with the extra water. I hope you have fun with this one, and please do let us know if you try it out. We are currently repeating the experiment as my Junior Scientists want to see the eggs with different colours… we will keep you posted!